Issue 12 is near and dear to my heart. It is the constant gardening of gratitude, the sweet celebration of all that we are, all we do and all the love we continue to share. 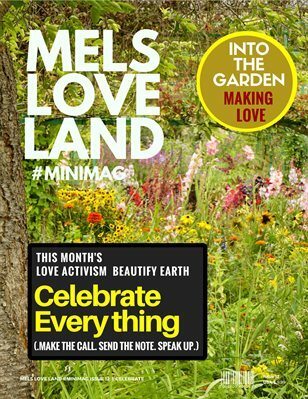 It is with much fanfare, lots of Unicorns, plenty of flowers, lots of gifts that we release Mels Love Land #MiniMag issue 12 | Celebration. Take this moment and the next to pop open some celebratory goodness as a bonus, this issue includes a special selection insert of Making Love A Priority: Consider the Possibility There is Another Way to Look at Any Situation. For us the quote from Muriel Barbery’s delightful quote ‘celebrate, celebrate, celebrate without losing your shorts’ seemed like a stroke of genius and great advise when I started my practice of loving everyone. Celebration became the ever beckoning siren song to ease on down the loving road. With this attitude and a commitment to celebrate each step, to find ways to applaud peoples accomplishments, to cheer for them when the doors opened, to give a giant hug of appreciation for a job well done. Everyday in every way it feels as important as any endeavor I’ve undertaken. It is an extension of loving action. When we celebrate ourselves, each other and our communities we express gratitude of the highest vibration and it is truly a ripple effect enlightening all our worlds. We are in shifting, changing, waking up reality. We need to unlearn way faster than we ever learned anything so we can start to learn anew. I started my love practice with the simple idea that everything I have ever thought is not true. ie. illusions are running rampant as we project our realities into the spaces we inhabit. My theory had to be tested and if this was the case I would have to engage in rethinking everything. Remaking a world ordered in loving celebration of everything that happens, every circumstance that comes forward and all the ways life picks you up after it’s slammed you down and begs you to go at it again. This wonderous prospect of disengaging from every thought I had, all the statements I make and all the ways that I hear and see what other people say required the strength of Job. I do have a leg up on some people as I was born with the gift of seeing the best in others. It is one of the greatest gifts of this lifetime and has almost taken me my whole lifetime to grow into. When I hear celebrate, celebrate, celebrate without losing my shorts it means exactly that. There are practical things we need in this world, things that our earthy structure needs to thrive and evolve and grow and move around every day. There isn’t any way to fully describe this it is a knowing and acceptance of all of your needs as an experience of practice. An experience of full and complete vulnerability and open heartedness that can withstand all the tears and laughter and ups and downs of the rollercoaster of existence. Gratefully, a celebration, confirms all the ways that love is constantly knocking on your door, and it is your job to not just hear it, but to open the door, invite love in and have a god darn celebration of all the amazing gifts you have been given. Enjoy each new day ahead finding new ways to celebrate each other and all the amazing things that are happening in your life and our world at large. Purchase a hard copy of Mels Love Land #MiniMag Issue 12 | Celebration by clicking on this link or follow the magcloud site badge below for some good minimag vibes. Also, please download a pdf version here. SPECIAL EXTRA MELS LOVE LAND – Making Love the Priority: Consider the Possibility there is Another Way.